Here at Creare we have been optimising Magento websites for over 4 years and have learned a few tips and techniques along the way. CreareSEO for Magento is the culmination of this experience and features a wide range of features that we deem to be crucial for on-site optimisation. Developed primarily for Magento CE 1.4-1.8 it is currently available to download via Magento Connect. We’ve enhanced and integrated our current HTML Sitemap extension into CreareSEO. The redundant meta keywords tag and its default values are removed from theas well as empty meta description tags, which are no use to anyone! Robots noindex is set on category pages with query-strings in the URL – something that gets added by layered navigation filters. First seen on GitHub, we’ve added an extra attribute to use as your H1 on category pages, meaning you can call it what you like without affecting your navigation menu. We’ve added the ability to redirect disabled products to categories and other products, meaning you’ll no longer have redundant links existing in search engines and the like. Breadcrumb links are wrapped in Google’s own rich snippet schema for improved structured data. We’ve removed the /home link and replaced it with your Base URL meaning you no longer have two versions of your homepage considered ‘home’. We’ve added a page in the admin which checks your default Magento config settings, to ensure certain things have been done for SEO best practice. You can remove the duplicate product button, meaning inexperienced users won’t accidentally create duplicate content. 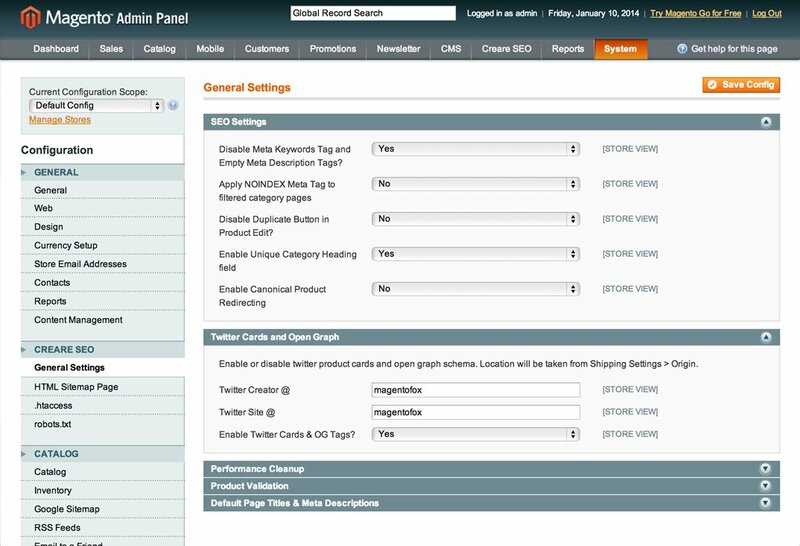 You can enable structured data for Twitter and Open Graph on product pages for content-rich social sharing. You can enable our cleanup scripts to run on a daily basis. Great for keeping certain database tables from growing out of control. Set your own default page titles and meta descriptions for products, categories and CMS pages. Set a custom page title and meta description on your contact page. Fight against duplicate content by adding some validation to your product editor. Can be configured to ensure no two product names, descriptions or short descriptions are the same. Will ensure that non-canonical product URLs (such as those in categories) will automatically redirect to your canonical product – meaning no loss of link equity for that URL! By implementing good on-site optimisation you will naturally increase the effectiveness of common off-site optimisation techniques such as link-building. 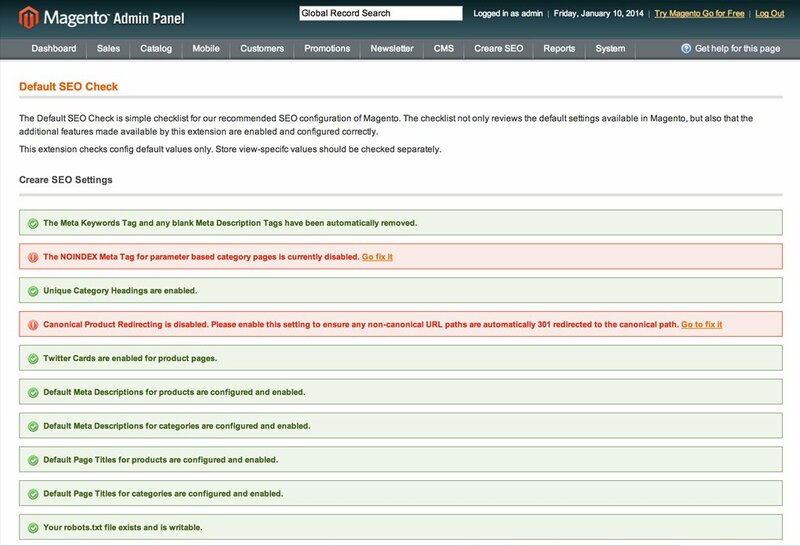 The Creare SEO extension helps to fix common Magento SEO flaws inherent to Magento CE (1.4 – 1.8) such as duplicate content, and links that go 404 not found pages (such as disabled products). We have taken recommendations from our SEO team, who have many years experience optimising Magento websites and have encountered many issues over the years! We’re always looking to improve our extension and if you feel that there are additional features that could help to make it better please feel free to let us know in the comments below.